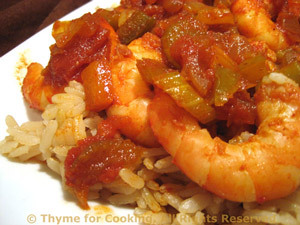 Shrimp Creole over Brown Rice, Thyme for Cooking easy main course. Chock full of vegetables and shrimp, you can make this as hot as you like. Mon mari likes lots of red Tabasco on his; I prefer the milder green. Serve over Brown Rice for a heart-healthy dinner. Roughly chop celery, pepper; chop onion and finely chop garlic. Roughly chop tomatoes, reserving all liquid. Heat oil in medium nonstick skillet over medium heat. Add chili powder, paprika and sauté for15 - 20 seconds. Add celery, onion, pepper and sauté for 5 minutes, until starting to become tender. Add tomatoes, their juices, paste, herbs and sauces. Bring to a boil, stirring well. Reduce heat to low and simmer uncovered for 10 minutes until vegetables are done and sauce starts to thicken. Taste and adjust sauce - adding Tabasco if desired. Turn heat to medium and add shrimp. Cook shrimp, stirring, until they start to curl and turn opaque, about 5 minutes. Remove from heat and spoon over brown rice. Cook rice according to package instructions adding the herbs with the stock or water.